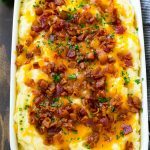 These mashed potatoes have all the flavors of a fully loaded baked potato in the form of an easy to make casserole. I serve this dish every year for Thanksgiving and it always gets rave reviews! In my family I am always put on mashed potato duty. I’ve made them so many times that I have it down to an exact science. But sometimes I want something a little more interesting than your standard mashed potatoes. This loaded mashed potato casserole jazzes up plain potatoes by adding everyone’s favorite baked potato toppings to the mix. Best of all, you can make the entire casserole a day in advance and just pop it in the oven to bake before it’s time to eat. How do you make mashed potato casserole? The first step is to cook your potatoes. 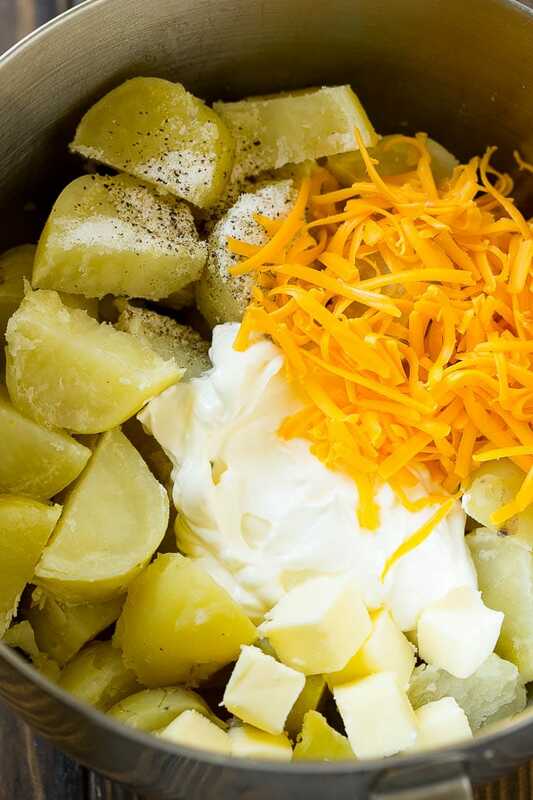 I boil my potatoes until they’re tender, then mash them up with plenty of butter, cheese, sour cream and seasonings. 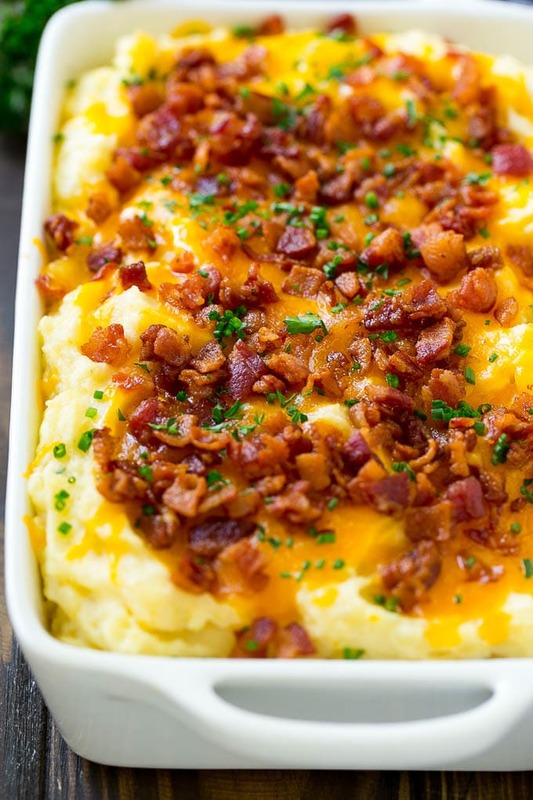 Afterwards, the mashed potatoes get spread into a casserole dish and then are topped with bacon and cheese and baked to perfection. The base of this casserole is sour cream mashed potatoes. Everyone seems to have preferences in terms of how they mash their spuds – some people like it chunky, others like it smooth. I prefer a smoother potato and I use a ricer to make sure there are no lumps left behind. If you don’t have a ricer, not a problem – this recipe also works with a traditional potato masher or you can even use your mixer (but never the food processor)! 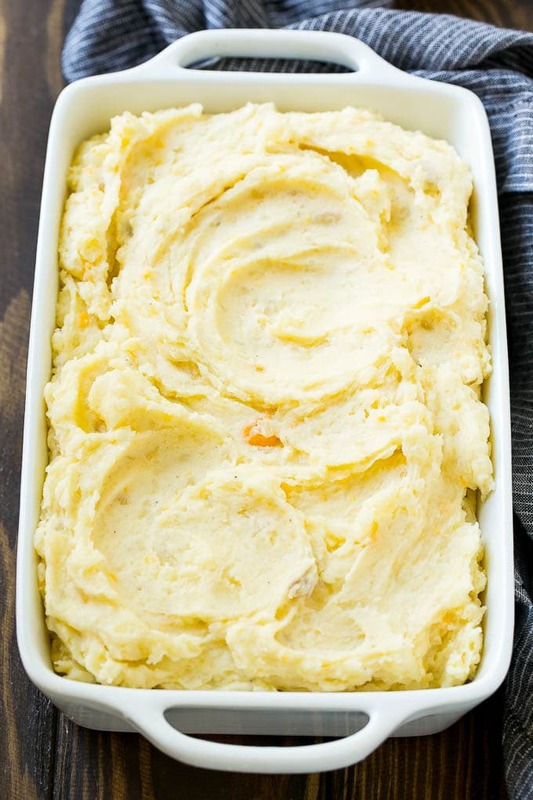 What I love about this mashed potato casserole is that it’s SO easy to make in advance! Simply mash your potatoes, put them in your casserole dish, and cover until you’re ready to bake. Right before the potatoes go into the oven, add the cheddar cheese. If you’re starting from a cold casserole, you’ll want to add about 10-15 minutes to the bake time. I add a sprinkling of bacon towards the end of the cook time, simply because I don’t want the bacon to burn before the potatoes are heated through. I top my loaded mashed potatoes with a sprinkling of chives and parsley for a fresh note. These mashed potatoes are on our table for every holiday, and there are never any leftovers. You definitely can’t argue with that kind of success! 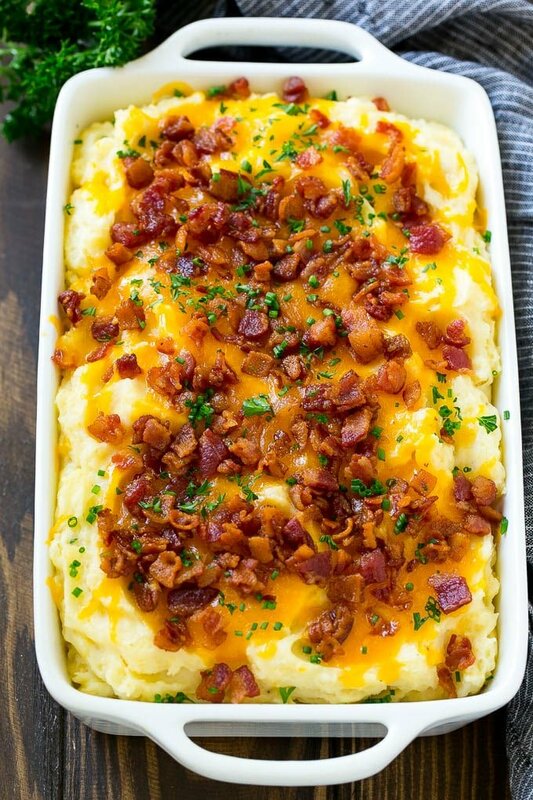 This make ahead loaded mashed potato casserole is full of bacon, cheese, sour cream and chives - it's the perfect no-fuss side dish for a holiday meal. Bring a large pot of water to a boil; add 2 tablespoons of salt. Place the potatoes in the pot and boil for 15-20 minutes or until potatoes are tender. Drain the potatoes. Run the potatoes through the ricer and transfer them back to the pot. Alternatively you can skip the ricing step and simply mash the potatoes with a potato masher or mixer. Stir in the milk, butter, sour cream and then add salt and pepper to taste. Stir in 1 cup of the cheddar cheese. Preheat the oven to 350 degrees F. Place the potatoes into a 9 inch square pan or 2 quart casserole dish. coated with cooking spray. Top with remaining 2/3 cup of cheddar cheese. Cover the pan with foil and place into the oven. Bake for 20 minutes. Remove the foil and add the bacon; bake, uncovered for an additional 20 minutes or until cheese is bubbly and potatoes are heated through. Sprinkle the chives and parsley over the top and serve immediately. 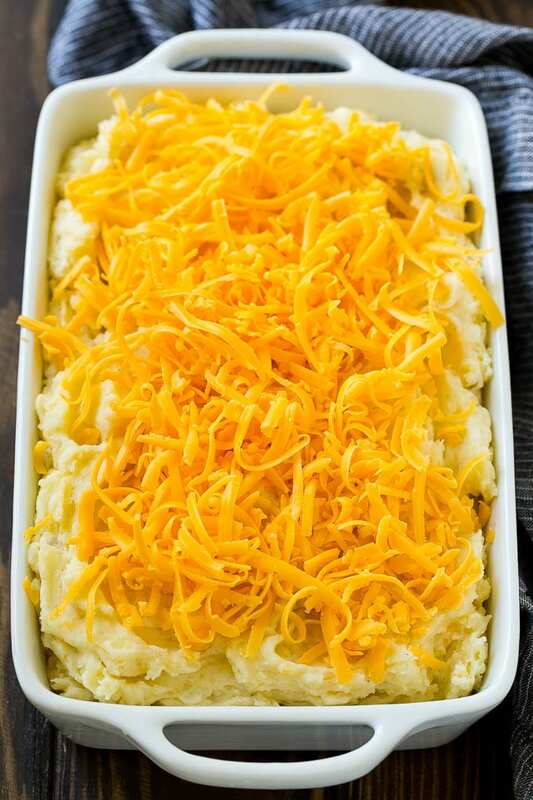 Make Ahead: Place the prepared mashed potatoes in the baking pan and top with cheese. Cover and place in the fridge for up to 24 hours. Proceed with the rest of the recipe instructions when you're ready to bake it. This post was originally published on November 24, 2015 and was updated on August 12, 2018 with new content. Your recipe says to “put them on a 9” pan. “ I’m hoping 9X13? ! Need a big recipe! It’s 9 inch square but you can double the recipe for a 9″x13″ pan! Is the calorie info per serving or for the whole dish? 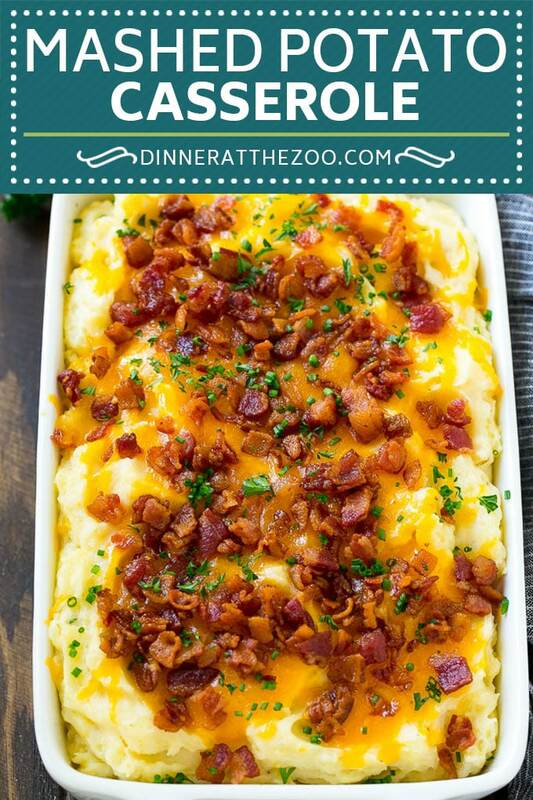 We love mashed potatoes and this recipe looks perfect for my family! 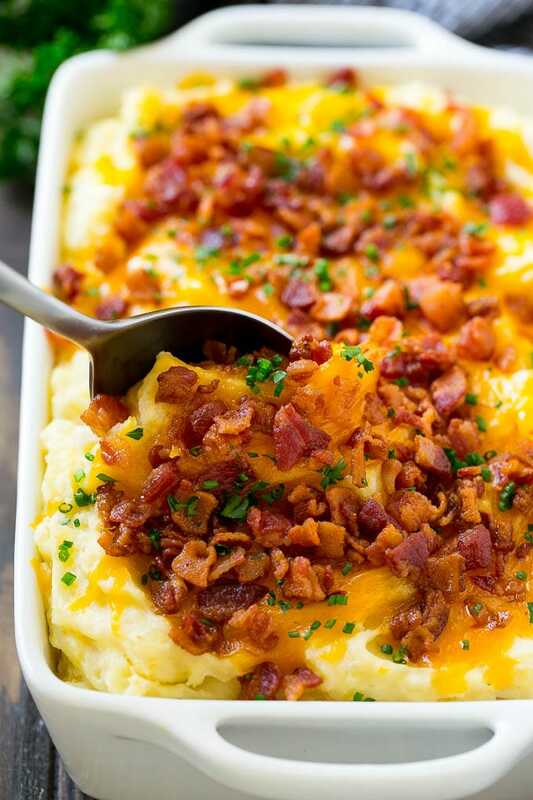 Mashed potatoes are so perfect for any dish and occasion. Having them with a favorite topping is so awesome! This is going to be an instant hit with the whole family! I mean, who doesn’t have a deep lover affair with mashed potatoes? This looks mouthwatering amazing! My family loves loaded baked potatoes Turning it into a casserole would be heaven!